President Umaru Yar’Adua has returned to Nigeria after 3 months away receiving medical treatment in Saudi Arabia. Apparently Yar’Adua flew back into Nigeria on Tuesday (February 23) night on board a presidential jet, while members of a government delegation that travelled to Saudi Arabia to see him, flew back to Nigeria in a separate plane, after not being allowed to see Yar’Adua. Reuters quoted a Saudi official at Jeddah airport as saying “”The president left at 10:22 p.m. (1922 GMT) alone in a plane and another plane carried Nigerian government envoys,” the official at Jeddah airport told Reuters. Al Jazeera has confirmed that Yar’Adua is back in Nigeria, in the capital Abuja. Reuters reported that two presidential planes landed in the presidential wing of Nigeria’s international airport in Abuja. The timing is very telling. The political mood in Nigeria has been moving toward having Yar’Adua PERMANENTLY declared incapacitated, and the “acting” President Good luck Jonathan has been treated with some hope and optimism with many assuming that Yar’Adua was not coming back, and urging Jonathan to carry out reforms. Things were not looking good for Yar’Adua: his cabinet ally Michael Aondoakaa was removed as Attorney-General and Justice Minister the same day that Jonathan became acting President. Then the cabinet were become increasingly insistent in demanding to know the state of Yar’Adua’s health. They went to so far as to send a delegation to Saudi Arabia with a mandate to physically see the President to ascertain his condition. Yar’Adua’s return must be viewed in this context. He and his allies are feeling the heat, and are trying to pre-empt any moves that could permanently sideline Yar’Adua from power. However now that Yar’Adua is back, what next? Is he healthy enough to resume as President? Will Jonathan stand aside for him? Things are heating up…. Another day, another political storm in Nigeria. The latest story doing the rounds is a 5 page memorandum submitted by the Information Minister Dora Akunyili to her fellow ministers in the Federal Executive Council in which she highlights the growing political vacuum caused by the absence of President Yar’Adua (70+ days and counting…). In her memo she forthrightly tells the FEC that the time has come to vest the VP Jonathan with the powers of acting President. Below is the full text of Dora’s memo…..
1. I want to start my humble submission by stating that I am a 100 per cent loyalist of President Yar’Adua. He appointed all of us because he trusts us and wants us to help him to run government effectively and efficiently. Mr. President has given all of us seated in this chamber the opportunity to serve our nation as members of this council. I believe that in the choice of all of us, as individuals and group, Mr. President must have considered our ability to guide him aright to serve our people better, promote and protect the constitution in line with the oath of office taken before him in this chamber by each and every one of us. President Yar’Adua is very dear to me just as he is to all of you. 2. We are all aware of what has been happening in Nigeria, especially as it concerns the issue of making the Vice President an acting President. There have been debates for and against. 3. Some have argued that there is no vacuum and that it is okay for the Vice President to function as Vice President, not as Acting President pending the return and recovery of Mr. President. For the proponents of this theory, I want to remind them that Permanent Secretaries had been waiting to be sworn in for over two months now. Consequently, many ministries are without Permanent Secretaries including my ministry. As it is today, the Vice President cannot take any document to National Assembly. In a very desperate situation like the recent Jos crisis, the Vice President deployed troops to Plateau, but many have openly said that he does not have the right because there cannot be two Commanders-in-Chief at a time. 4. Just recently, Movement for the Emancipation of Niger Delta, MEND, has opted out of the amnesty and resumed hostility. They argued that they have been kept in limbo since the President took ill and they appeared to have been abandoned since nobody could talk to them or keep the promise made to them. Our economy is once more being threatened. 5. The past Chief Justice of the Federation swore in his successor for the first time in the history of our nation. The power vacuum at that level has also compounded our ‘poor image’ at the international level because of our failure to rise to international expectations, commitments and engagements that require the presence of our President. Many of those opportunities have existed in the past 70 days that I do not need to recount. I do not need to repeat the uncomplimentary statements made by United States, United Kingdom and EU concerning the current state of affairs in Nigeria . 6. There has been persistent agitation by the public for members of the Federal Executive Council to do something. Nigerians expect us to rise to this challenge on behalf of our President as the leader of this administration. Some eminent citizens have spoken. They include former Heads of State and others who have served our nation in various capacities. The Senate has also taken a position of which we are all aware. The looming crisis in the system is over boiling. Our hard earned democracy is being threatened by the day. 7. What went wrong? We love our President but we should remember that he is not infallible. Before he left Nigeria he had a moral and constitutional obligation to officially inform the Senate and hand over the mantle of leadership to the Vice President pending his return and recovery. That did not happen. Yes, the mistake has been made by our Boss and our brother. Mr. President is ill and did not choose to be sick. But while we continue to pray for his recovery, we should try to right the wrong. 8. Some have argued that he left the country in a hurry. This argument has been punctured by the fact that he signed the Appropriation Bill for National Assembly. If he could sign the Bill, why did he not sign a letter for Vice President to act on his behalf until he is well enough? 9. We have a local proverb that says that “A goat does not get strangulated by the rope used in tying it when an adult is present.” We are all in a better position to know that the polity is overheated to a frightening level. Posterity will judge us harshly if we do not positively intervene to resolve this logjam. 10. I wish to call on the Federal Executive Council to act now in the best interest of our dear President and our dear Nation. We also need to save ourselves from shame because our stand is becoming very embarrassing. He has been away for about 70 days now, even if he returns tomorrow, is it not better for him to rest and recover before taking over from the Vice President? 11. We need to do what is morally right and constitutional for the President to officially hand over to the Vice President to function as Acting President. If he does not, we can evoke whichever aspect of the constitution that should make the Vice President an Acting President. On the other hand we can take advantage of the 14 days ultimatum by the court which will expire on Friday. When the President resumes duty as soon as he recovers, by the grace of God, he takes over his position. 12. I am not saying that President Yar’Adua should resign or condemn him for being sick. He did not choose to be sick. We will continue to pray for him, but all I am saying is, let us encourage him do the right thing so that our hard earned democracy will not be truncated. Anybody who feels otherwise is unfair to our President (who has been preaching the rule of law), and utterly unfair to our country. 13. The name of our President and all his achievements are being rubbished by this unfortunate debacle. The President and his family are also being put under undue pressure which will not help his recovery. Cabinet to Rule on Yar’Adua’s Status? The Federal High Court has ordered the Federal Executive Council (cabinet) to rule on whether President Yar’Adua is still fit to lead the country. It also ruled that the cabinet should hear testimony about Yar’Adua’s condition from 5 doctors (one of whom has to be Yar’Adua’s doctor). For a video analysis of the latest news, and a timeline of the saga, click the URL at the top of this post. The Yar’Adua absence saga is becoming embarrassing. The Foreign Minister Ojo Maduekwe was interviewed by the BBC on its BBC “Hardtalk” programme. It is very uncomfortable viewing. Maduekwe stumbled and stammered through the interview as the BBC interviewer fired poignant questions at him about Nigeria’s crumbling foreign reputation over the Mutallab terror plot, and President Yar’Adua’s long absence from the country. Maduekwe was asked when he last spoke to Yar’Adua, and replied that he had not spoken to the President since he went out of the country for medical treatment. The incredulous interviewer can barely contain himself when he excitedly exclaims his horror at the fact that the Foreign Minister of a country has not spoken to his own President for 2 months and is barely peturbed by it. Maduekwe stumbled with a response of “slightly less than 2 months”….and was very uncomfortable when being confronted with the banality of a situation where Nigeria is faced with a major foreign policy crisis that denigrates its image, associates it with terrorism and yet the President is unable to speak to his Foreign Minister about it or issue a policy statement in response to being blacklisted as a terror hotspot by America. Click below to watch the uncomfortable interview…. When the President is Sick – What is Supposed to Happen? There have been rumours, counter-rumours, allegations of ill-health, death and brain damage. One American newspaper even went so far as to claim that Yar’Adua died on December 10. If this story is true it would would place Yar’Adua in very illustrious company as one of a select band of few human beings to resurrect from the dead (Yar’Adua was interviewed by the BBC this week). Is Yar’Adua Supposed to Formally Hand Over to his Vice-President During His Absence? The trouble is that section 145 does not say what will happen if the President does NOT give the Senate President and the Speaker of the House of Representatives a written declaration of his absence from the country or incapacitation. Did Yar’Adua give such a notice to Mark and Bankole? If so, Goodluck Jonathan has de facto been exercising Yar’Adua’s powers since Yar’Adua left the country last November. If he did not give the written declaration…..the situation is murky. That is why we are in the current limbo. So Why Doesn’t Yar’Adua Just Formally Designate that the Vice-President is in Charge Till He Returns? The President and his supporters are far too politically savvy for that. Nigeria’s ruling PDP political party operates something called “zoning”. It “zones” (i.e. allocates and rotates) its presidential candidate between different parts of the country. The PDP’s previous presidential candidate was former President Obasanjo (a Yoruba Christian from the south) who stood as PDP candidate and President for two terms of office (1999-2003 and 2003-2007). When Obasanjo’s term of office expired in 2007, the PDP zoned the presidency to the north and its candidate Umaru Musa Yar’Adua (the current President and a Fulani Muslim from the north). 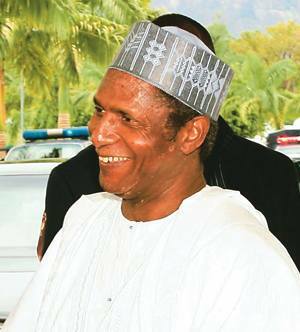 The expectation is that Yar’Adua will serve 2 terms of office (i.e. until 2015) before the PDP “zones” the presidency back to the south. Northerners fear that allowing Vice-President Jonathan to stand in for Yar’Adua will eat into or truncate its “turn” in the presidency. Can Yar’Adua Be Removed From Office Due to His Absence? Yes – but it is VERY difficult. The declaration then has to be verified by a medical panel of 5 doctors (including Yar’Adua’s own doctor), confrming that the President has been PERMANENTLY incapable of discharging his functions. The trouble is, section 145 does not say what will happen if the President does NOT give the Senate President and the Speaker of the House of Representatives a written declaration of his absence from the country or incapacitation. Did Yar’Adua give such a notice to Mark and Bankole? If so, Goodluck Jonathan has de facto been exercising Yar’Adua’s powers since Yar’Adua left the country last November. If he did not give the written declaration…..the situation is murky. That is why we are in the current limbo. Well it seems that Nigerian President Umaru Yar’Adua’s mysterious illness and 6 week absence from the country has been turned into an object of ridicule and comedy by the Nigerian media. American radio and MSNBC television personality Rachel Maddow presented this parody on Yar’Adua’s absence, and on the Vice-President Goodluck Jonathan. I am really concerned about Yar’Adua’s health. He coughed repeatedly during this speech. A very interesting story. Will this apply to ALL convicted coup plotters in Nigeria’s history? If this is true, then this will wipe the slate clean for ex-convicted coup plotters like Vatsa, Orkar and Bissalla. I wonder how those plotted against will feel about this? e.g. IBB, the family of Murtala Muhammed etc. There are strong indications that President Umaru Yar’Adua will on Thursday exercise his constitutional prerogative of mercy when he announces the state pardon for all those who had committed acts of treason against the Nigerian state and had been convicted for coup plotting. Most prominent among those who will receive the state pardon is dismissed Lieutenant General Oladipo Diya who was arrested in December 1997 alongside other generals and put on trial for allegedly plotting to overthrow the regime of General Sani Abacha in which administration he had served as the second in command. Diya who had been in detention at the Jos Prison at the sudden death of General Abacha on June 8 1998 was set free alongside other high profile accused felons by the intervening government of General Abdulsalami Abubakar, but had never been pardoned. The short-lived Abubakar regime also released all those who had implicated in 1995 along with Obasanjo and were serving different terms of imprisonment in different prisons across the country. Notably, the only person in Nigeria who had been pardoned for plotting a coup in the history of country was General Olusegun Obasanjo who was implicated in an abortive coup of 1995, arrested, tried and jailed for life but later had his term commuted to 25 years. He was at the Yola Prisons when Abacha died. The special pardon which he received in 1998 was to enable him contest for the presidential election of 1999. He, however, failed to pardon those who were convicted and jailed along with him all through his eight years in office. Zumarockreports.com reliably learnt that the wholesale pardon that would be extended to all those who had been found guilty of coup making was being made as part of the amnesty exercise for the Niger Delta militants which President Yar’Adua is expected to announce and bring into effect on the same Thursday. It was also learnt that the pardon to be granted to coup plotters is in reaction to what our correspondent learnt is the complaint among the military high command that the activities of militants are tantamount to waging wars against the state of Nigeria and were said to have argued that they should be treated more severely than coup plotters. Observers, therefore, believe that the government is extending the amnesty to former coup plotters at the same time as the militants, in the recognition of the spirit de corps feeling of the military. After a long wait, Nigeria’s President Umaru Yar’Adua has finally completed his cabinet reshuffle. The list of “new” ministers is underwhelming and there are no radical differences. The notorious Attorney-General and Justice Minister Michael Aondoakaa has been retained (he of Ribadu hounding and Ibori protecting fame). So do not expect any corrupt ministers, officials or former Governors who looted the state treasury to be prosecuted any time soon. As long as Aondoakaa remains in office, Nigeria will remain a Shangri-La for looters of state funds. Noteworthy new ministers are Professor Dora Akunyili – formerly head of Nigeria’s National Agency for Food And Drugs Administration and Control (NAFDAC). When it was announced that she was shortlisted for a ministry, it was presumed she would be made the new Minister of Health (she is a Professor of Pharmacy). However instead she was instead appointed Minister of Information and Communications (the government’s chief propaganda minister) which is an odd post for a Pharmacy Professor who gained fame battling peddlers of fake pharmaceutical drugs. Lots of old “new” faces in the new Federal Executive Council. The former OPEC Secretary-General Dr Rilwanu Lukman returns to the government yet again as Petroleum Minister. As a reminder, Lukman first held this post under the regime of Ibrahim Babangida in 1986 – 22 years ago (yes TWENTY TWO). He also served as Babangida’s Minister of Mines, Power and Steel, and as Foreign Minister. He was an energy adviser to the immediate past government of President Obasanjo. Another familiar face is the new Minister for Special Duties Ambassador Ibrahim Musa Kazaure. I recall cringing with embarassment several years ago when immediately after the execution of Ken Saro-Wiwa and other Ogoni activists by the Abacha regime, Kazaure appeared on national television in the UK to defend the execution and Abacha’s regime. Kazaure was then serving in an ambassadorial role for the Abacha military regime.